Do you still remember me? It's been quite a while since we last met for your services. 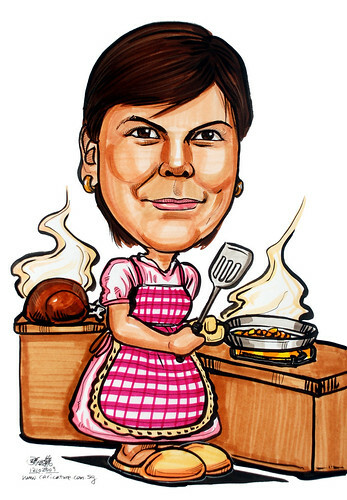 We will present the caricature at her retirement lunch on Oct 16 so anytime it is ready before this date, I'll pick it up from you"
Can't remember how many orders I have received from ExxonMobil. I did a serach with keyword - "ExxonMobil" on my blog. Then I realised that Blogger doesn't give you all the results from the search. The older one doesn't appear on the serach result. I was given 2 photos of the subject. The confusing part was her hair colour. Under the sun, her hair was light blonde in colour. The other photo was taken in a studio, like those formal passport photo. Her hair was brown!!! My wife said that the subject could have dyed her hair. I chose the second photo, given that this could be what she submitted to the company archive.